You can be enjoying hot, fluffy mini doughnuts in just 15 minutes with this clever recipe. The smooth ricotta batter is easy to whip up for moreish treats that are crispy on the outside and deliciously soft on the inside. 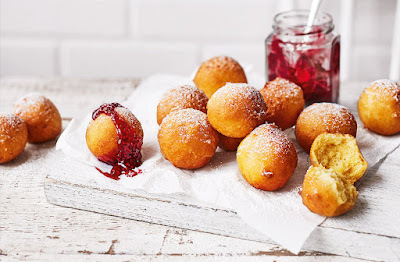 Sprinkle the doughnuts with icing sugar and dip generously into warm raspberry jam to enjoy. or until a small piece of bread turns golden in 30 secs when dropped into the oil. Meanwhile, whisk the ricotta, eggs, vanilla and caster sugar in a large bowl until smooth. Sift in the flour, baking powder and ¼ tsp salt; fold in with a metal spoon. Grease a large baking tray and your hands with oil. Use a teaspoon to shape the dough into 24 balls, then transfer to the tray. Working in batches so as not to overcrowd the pan, gently place the balls in the hot oil and fry for 3½-4 mins, turning once or twice, until they turn an even, golden brown. Use a slotted spoon to transfer the cooked doughnuts to a wire rack lined with kitchen paper to cool a little. Serve dusted with icing sugar and raspberry jam for dipping, if you like. Tip: For the perfect dipping consistency, microwave the jam in a heatproof bowl in 10-second bursts for 30 seconds, stirring in between.